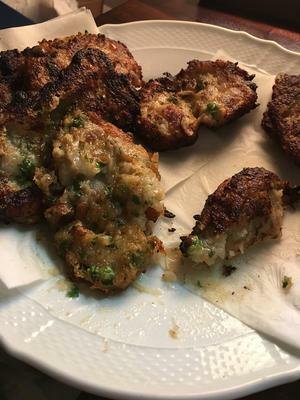 I made some aloo tikki using a recipe from an Indian lady. They came out delicious, but the problem is that they seem uncooked. They are golden-brown on the outside, but the inside is extremely mushy, and they simply fall apart on my fork. Any advice to make them firmer? Thank you! You have not written the other ingredients or the method you used to make aloo tikkis. - If tikis have blackened on outside and seem uncooked inside, the flame was too high while cooking. Try cooking on a medium flame. - If the tikis are falling apart, the binding is not enough. Add some bread crumbs or corn flour to potato mix as binding. You may also add rice flour or plain flour. 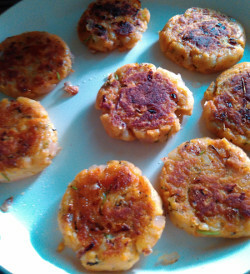 You may visit the page given below to see photos of the steps to make aloo tikki. I am giving my method below. Hope that helps you. I boil potatoes. Cool completely and mash. Add spices, salt and some rice flour or bread crumbs or some corn flour or plain flour. This helps as a binding, in holding the shape of the tikki/patty. Heat pan. Cook patty on medium flame using a little oil to shallow fry them. Cook on one side till it gets brown spots. Then turn to the other side and cook the other side. No need to turn tikki too many times. I hope, next time you get aloo tikkies to your satisfaction. Let me know in the comments below if you have any more questions related to aloo tikki.